Egg Gunners in the original trailer. Believed to be in Kingdom Valley. Egg Gunners are combat automatons constructed by Dr. Ivo "Eggman" Robotnik, deployed by the mad scientist in and around Soleanna as his principal robotic footsoldiers during Sonic the Hedgehog (2006). Typically equipped with an arm-mounted vulcan cannon and hover / flight capability via jet modules attached to the legs, Egg Gunners represent an unusually humanoid and overall menacing turn in machine design by Eggman, in keeping with Sonic '06's revised aesthetic. First seen being disgorged from the Egg Carrier during Sonic's opening sequence, the automata come in a variety of different models, chiefly distinguishable by colour. The Egg Gunner is basic white, while the Egg Stinger comes in crimson, the Egg Lancer comes in blue and there's a third Egg Gunner which is coloured yellow, but it was never named. Some sport cluster rocket launchers and / or additional flight thrusters, while others wield more exotic weapon types like static stun charges. 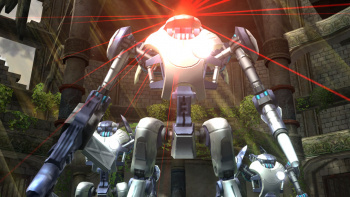 Although the robots have not featured as enemies in any game beyond Sonic '06, they appeared as collectable card #109 in Sonic Rivals 2, unlocked by S-ranking Neon Palace Zone Act 3.